With the development of modern weapons technologies also new legal questions and ethical discourses arise continually. Still today, debates on the forms of use for aircraft are held in a controversial manner. In a quote the minister of defense, Thomas de Maizière, who initiated a round of talks on the topic of "military operations and the responsibility over life and death", said: "The targeted attack is more criticized than the bomb which possibly kills many." 1 In the context the minister talks about ethical and legal questions regarding the intention of killing specific persons, but the used terms illustrate the field of tension of this paper. The term "targeted attack" is commonly used in discussions about asymmetrical warfare. Today, warfare is about surgical precision and in many cases aircraft are the method of choice. Thinking about unaimed bombing attacks "which kill many" is more associated with large-scale wars of the past. However, in some cases does not exist a significant difference in conducting this two types of warfare. I consider both historically, based on the Air Policing in Iraq and the bomb war against Germany. Thus, the question is: To what extent did the experiences gathered in Iraq characterize the strategic bomb war against Germany? What is the element of connection and which impact had the operations of the Royal Air Force (RAF) in Iraq on the Bomber Command? In the British doctrine of air warfare the most striking feature is the concept of the "moral effect". It evolved during the First World War and dominated the RAF doctrine throughout the following years. The intention is to achieve the desired result not by the destruction of property and human life, but by constant interruption of normal life. A concept only has an effect by people who put it into practice and who pass it on to their successors. The fact, that there were at the same time personnel and cognitive continuities, caused an anchoring of handed down opinions to such an extent, that the decision makers suffered from a cognitive dissonance, which developed from the Iraq-experiences and the "moral bombing" was -- given the questionable military benefit -- the actual "panacea target". What means the term "personnel continuities"? From the whole of the RAF personnel between 1919 and 1945, I separate the sub-quantities of those RAF officers who served between 1919 and 1932 in Iraq and the sub-quantity of RAF officers who served in the Bomber Command between 1939 and 1945. 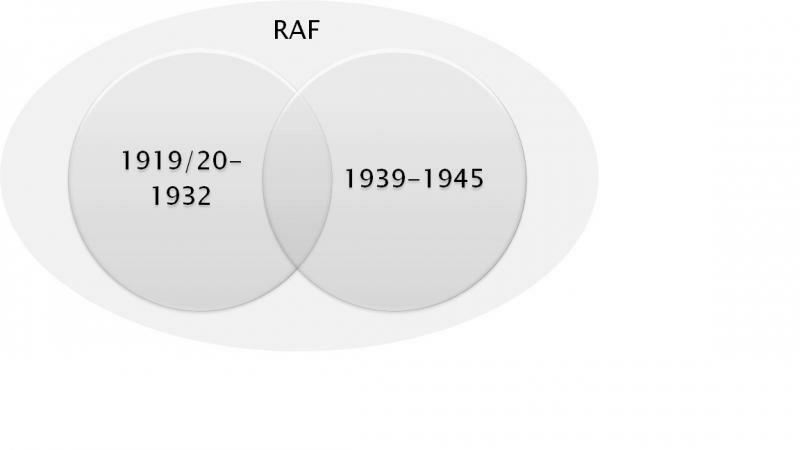 The intersection of both subsets, which cover the tactical, operational and strategic level, is object of investigation, and therefore those RAF officers who had served both, in Iraq as well as in the Bomber Command during the Second World War (Figure 1). After the end of the First World War, Great Britain was in a difficult situation. The coffers were empty and the population was war-weary. The "ten year rule" had reduced the budget concerning the background, that no war may be expected over the following ten years and the set up committee slashed all funds which were not absolutely required. The young RAF shrank by a quarter of a million men to a basis. Many problems on the domestic front which were disregarded during the war, emerged again and especially on the periphery the danger of rebellions increased. However, how could the Empire be secured by means of hardly existing financial resources, troops reduced to a minimum and a war-weary population at home? In view of the situation described above, an uprising in Somaliland 1919 resulted in a request made at the Chief of the Air Staff, Hugh Trenchard, if the RAF possibly could solve this problem more inexpensive than the ground troops. Actually, it was possible to complete this operation within a short period of time and the costs were only 77.000 pounds, instead of estimated six million pounds. 2 The RAF had proven itself primarily as an economic instrument and had discovered a role to justify its independent continued existence. Air Policing and thus the use of aircraft in order to restore or maintain domestic security, had become socially acceptable. The operation in Iraq expanded the field of responsibility and is called Air Control. That means, that the Air Ministry takes responsibility for securing a region and the local RAF has the command of all deployed troops. This particular situation emerged for the first time in Iraq. 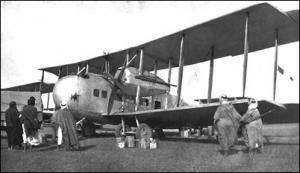 1922 the RAF took command, until the independence of Iraq ten years later. Iraq or Mesopotamia as the area was called until 1922, was until the end of the First World War a part of the Ottoman Empire and largely populated by independent tribes. Difficult clan structures and especially the Kurds who strived for independence fueled the situation and added to its complexity. During the First World War Great Britain supported the uprising against the Ottomans and occupied key positions. In return, the British held out the prospect of an independent Arab state. But already in 1916 they agreed with the French on the future division of the Arab provinces, but the promise should not be kept. After the war, Great Britain was constituted as mandatory power by the League of Nations. Mandates were territories of the defeated Central Powers, which should conduct the mandatory powers to independence. As a result, the new state became a member of the League of Nations and the troops withdrew gradually. The fact of a new suzerainty, the establishment of British-Indian administrative structures, a rigid tax policy and especially the intermix of different ethnical and religious groups which was a result of the artificial demarcation, fueled the displeasure of the population which resulted in an uprising in 1920. It was only possible to put this rebellion down at substantial losses and with the help of reinforcements from India. More than 2000 deaths and costs in excess of 100 million pounds were the result for the British side. 3There were two specific consequences: the costs for an effective control were far too high and it was essential for domestic security to install an Iraqi government. Winston Churchill, who was now Minister of Colonies, convened the Cairo conference in 1921, during which the future development of Iraq was discussed. Here, the overall focus was, to work as inexpensive as possible. In this context, the experiences of 1919 almost presented the use of aircraft. A king was appointed and in 1924 an Anglo-Iraqi treaty was negotiated by the indirect government ("control without occupation"). Great Britain reserved the right of bases, determined important financial and economic issues and installed consultants in all Iraqi ministries. This treaty however, fueled the nationalist movement in Iraq and provided the breeding ground for rebellions. Only in 1930 a new treaty was adopted, which ended the mandatory power. The Kurds represented a critical problem. After the unclear border demarcation between Turkey and Iraq was clarified 1925, the territory of the Kurds was integrated into an Arab country. Instead of getting the hopes for a sovereign state fulfilled, they had to live in a country which was dominated by other ethnic groups. After the disastrous rebellion 1920 and the decision of the Cairo conference to use aircraft, in order to fight the rebellion, "Air Control" became operative in October 1922. While the annual expenditure was 30 million pound in 1920, it was only 8 million pound with the takeover of the RAF. 4 The RAF was in continuous operation. In the North, Turkey claimed its old territories and fueled rebellions. The Kurdish Sheikh Mahmud, which had become a permanent problem, opposed the British for years and in the South tribal conflicts became more frequent. Combined air-ground operations resulted in rapid success regarding the suppression of rebellions. Especially the "forward strategy" against the Turks confirmed the RAF in its role, when it averted the threat of an evacuation of the North. They gathered more laurels during the continuous operations against Mahmud, who was not without good reason humorously called "Director of RAF Training". Iraq joined the League of Nations as a self-governing state in October 1932 and a treaty of alliance with Great Britain came into effect. Air Policing was the instrument which secured the survival of the RAF. First of all it was financially inexpensive, endangered own soldiers to a lesser extent and thus, replaced the expensive and risky punitive expedition with bomb raids from the air. In a war-weary Great Britain it could also be propagated as a human instrument, as there were only small losses on both sides and because the attacks were performed precisely and after a previous warning. In my paper I would like to show, that reality deviated from rhetoric and how this method of counterinsurgency from the air affected the strategic bomb war against Germany. Research on the topic of "aerial warfare" often repeats questions and methods. The knowledge gain of more traditional studies decreases with the source situation which has already been used to a large extent. As a result, comparative approaches appear as promising and follow international research regarding their actuality of developments. My paper intends to continue the discussion about ways of aerial warfare, by adding a cognitive perspective to the dominant technical or operative-tactical one. The cognitive perspective reveals itself while considering the strategic aerial warfare and especially the operational doctrine of the air force. A doctrine is based on experience, perceptions and moral concepts and reflects the conception of war and the idea of man of a society. Cognitions are the basis for all operations and directives for action. In research literature, both campaigns are hardly linked with each other because of their distinct differences. The world of ideas of the protagonists however and their manifestation within the operational reality, is comparable. On the one hand this approach serves as a distinction to research with a technical or operational focus and on the other hand it contributes, to show interconnections between phenomena which appear at first sight entirely different. 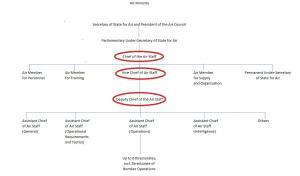 The question of the transfer of gathered experiences is developed against the background of personnel continuity. The careers of RAF officers, who served in both campaigns are focused. 5 A person cannot disengage entirely from its subjectivity and its past and thus it is less the question, if experiences from Iraq were transferred to a large-scale war, but to what extent this happened. Between 1936, the foundation of the Bomber Command and 1945, there were 12 Bombing Groups. During the period 1939 to 1945 they had 47 different commanders. 26 - that means 55% - of these commanders between 1939 and 1945 had Iraq-experiences. Between 1939 and 1945 there were 20 commanders without Iraq-experiences. That means 42%. Most of these commanders had deployments in India and Palestine/Transjordan. Summarizing it can be said, that almost all later commanders had foreign experiences and half of the commanders gained these experiences with a focus on Iraq. What was the distribution with regard to the leadership in the Bomber Command? The predecessor of the Bomber Command, the Air Defence of Great Britain (ADGB) had five commanders during the period from 1925 to 1935. Three of them were former Chief of the Iraq Command. One of them was supreme commander of the RAF Middle East and one of them commanded the RAF in India. Thus, the predecessor of the Bomber Command was already interspersed with officers of the highest positions in Iraq (Figure 2). When the Bomber Command was established in 1936, it had six commanders until 1945. One of them was chief of the Iraq command and one of them in the Iraq Command headquarters. One commander was chief of the RAF in India, one chief of the RAF in Aden and one in the staff of the Middle East Command in Egypt. The most prominent, Arthur Harris, was Squadron Leader in Iraq and not entirely by chance, his former squadron comrade Robert Saundby, was his deputy. Here as well, Iraq veterans are dominating. Within the twenty years from 1925 to 1945 six of ten commanders, who mostly had held a post in the Iraq Command, were leading. The position of the Senior Air Staff Officer (SASO), incorporated into the operational level, was held by 5 persons between 1936 and 1945. Four of them were Iraq veterans and one was deployed in the HQ Middle East. Thus, the operational level is staffed completely by Iraq veterans. If the RAF Staff College is taken into consideration as institution where experiences and doctrines are handed down, we have the following situation. After the foundation 1922 until 1945, the College had 9 commanders. The first two were appointed chief of the Iraq Command after that and then as well chief of the ADGB or the Bomber Command. The following commanders also had normally experiences as commanders in India and Transjordan/Palestine. Already here the interconnections become apparent. An example is the "Squadron 45 phenomenon": Arthur Harris was Squadron Leader in Iraq from 1922 to 1924. Ralph Cochrane and Robert Saundby served at the same time under Harris. In 1924 Roderic Hill took the Squadron over from Harris. All of them knew each other from the same unit in Iraq. In February 1942, Harris was appointed chief of the Bomber Command and seven months after him, Hill took over the position as commander of the Staff College and thus the training of the leaders to be. Robert Saundby was already SASO when Harris took up his appointment and in the following year he became deputy chief of the Bomber Command. Ralph Cochrane takes over the command of a Bomber Group seven months after Harris took up his appointment. Harris described him as most suitable successor. As a result this means that the members of the Squadron 45 which had served in Iraq from 1922 to 1924 held the position of the Bomber Command Chief, the deputy Bomber Command Chief, the SASO and the commander of the Staff College and therefore the training, at the time when the Harris had intensified the bomb war. Furthermore they had a Bomber Group Commander. To put it another way -- the strategic, the operative, was part of the tactical level and at the turning point to the "area bombing" the leader training was in the hands of former Squadron 45 Iraq-veterans. In the highest ranks of the Royal Air Force respectively the Bomber Command the paths of the affected persons crossed already in Iraq, respectively the Middle East Command. Born around 1880, the later heads of Bomber Command mostly led squadrons during the First World War and/or were deployed in the staff. During the time between the wars, all were deployed as Air Officer Commanding and many of them also had first experiences with posts in the Air Ministry or the Staff College. The SASO's, born around 1890 were responsible for the operational implementation. Here, the careers are quite similar as well and they had been deployed as pilots or Flight Commander during the First World War. During the time after the war they commanded squadrons, mostly attended the Staff College and had first deployments in the staff. The Group Captains, born around 1895, can only fall back on experiences from the First World War in some cases. They gathered their first experiences in aerial warfare during the operations in Iraq or in other peripheral territories of the Empire, but already under the command of the later key figures of the Bomber Command respectively the Royal Air Force and under the influence of the teaching material of the RAF College. To sum up this means, that the post of the commander of the Bomber Command was filled continuously with Iraq veterans from 1937 past 1945, the post of the deputy commander from 1943 to 1945 and also the post of the SASO from 1936 to 1945. Except the 8th Pathfinder Group which was established only 1943 under a very young commander, all Bomber Group commanders had operational experience from Iraq (Figure 3). The top position of the RAF, Chief of the Air Staff, was filled with Iraq-veterans from 1919 until 1940 (I include Hugh Trenchard here). 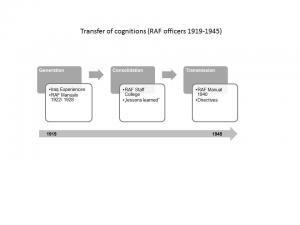 The posts of the Vice Chief of the Air Staff and the Deputy Chief of the Air Staff were as well in the hands of Iraq-veterans from 1940 until 1945, with a brief interruption (Figure 4). There were interconnections for a steady transfer of cognitions. What was transferred? I would like to single out a small section and show the transfer process exemplarily by the example of the doctrine of the "moral effect". Here, we have a quotation from 1923 regarding the bombardment policy in Iraq. Bomb attacks cause the capitulation of the enemy not by causing material damage, but by causing a disruption of daily life. Already in the following year considerations were made, to transfer this method of counterinsurgency to a large-scale war. It is necessary to make life unbearable for the enemy. The manual from 1928 places now officially great emphasis on the "moral effect". Two years later in 1930, this method of "moral bombing" is again transferred to "small wars". The disruption of daily life should be caused by attacking the basis of life, what will make life so unbearable that a capitualtion will be inevitable. Memos with regard to the bombardment policy from the year 1941 read almost the same as 20 years ago. Here, identical respectively synonymous terms are used as well, but now with regard to a large-scale war. In the following quotation we have a direct reference to Iraq and a connection to the strategic bomb war becomes apparent. The RAF manual which was newly issued in the year 1940 says that the functioning of the daily life depends significantly from a functioning of the infrastructure and supplying the population. This is exactly, what has to be cut-off, in order to undermine the morals of the enemy and cause a collapse of the national will to conduct a war. The basis of life is targeted here as well. Here you can see the connection between the Iraq bombardment policy of 1923 and the RAF Manual of 1940. The disruption of public life results in the collapse of the will to conduct the war. Demands for attacking the livelihoods, are characterised by a call for punishment, which definitely included causing heavy casualties. Already in 1920 in Iraq, there were demands for continuous attacks against public life, combined with causing severe damage in material terms. The result: The insurgents will capitulate and the message of the lesson will spread widely and bring potential insurgents back to reason beforehand. This example of 1921 makes the intention apparent, to strike out vehemently against the inhabitants and their livelihoods by day and night, in order to teach them a lesson. This method was included in the manual of 1928. "Moral bombing", which should have the character of a lesson, should definitely be accompanied with severe casualties and damages. The manual of 1940 refers to this kind of conditioning. What did that mean in practice? Here I would like to take Arthur Harris as most prominent figure. Harris confirms personally, that "morals" and "disruption of life" are rather vague terms and play down the effects of air raids to a large extent. Ultimately it is about "real effects" and not about "moral effects". Here, Harris explains what are the "real effects" in practice and that they are definitely understood by the involved. In order to maximize the effects however, it has to be the objective, to conduct air raids round the clock. These were quotations from 1923/24. As Chief of the Bomber Command in 1943, Harris does some straight talking regarding what air raids are about -- namely the killing of inhabitants and the destruction of the livelihoods. The experiences in Iraq fueled the blind trust in the "moral effect" of bombardments during the 1930s and cumulated during the strategic bomb war. The RAF considered itself and its doctrine as proven when she could survive as independent branch of military, which was threatened from all sides. These experiences formed the self-perception of the RAF-members and particularly the belief in their doctrine. The "air force spirit" which was demanded by Trenchard and which had to be developed by the young RAF, aroused in Iraq within the "tradition of punishment", how I call it. This statement shows clearly, that the decision makers did not distinguish significantly between the bombing of the inhabitants of Arabian or Kurdish villages and civilians in German cities. There exists a remarkable difference between rhetoric and reality. Context and intensity of both campaigns were completely different, but the people who fought and commanded were the same. Everybody is a product of former experiences. Cognitions, shaped by the past, have an impact on future conflicts, regardless of its context and intensity. Asymmetrical warfare is the operational reality nowadays and the intentions and also the methods are quite similar to those which were used in Iraq. The journalist David Sanger recently published a book about the warfare of Barack Obama. During an interview with the CNN, he explained the strategy which has a lot in common with the Air Control in Iraq regarding the choice of words and the intention. Referring to the quotation from the beginning I want to remark, that the targeted attack during the escalation of a conflict may possibly imply the bomb, which kills many. 2. David Omissi, Air Power and colonial control. The Royal Air Force 1919-1939, Manchester 1990, pp. 14-15. 3. Brian Burridge, The Trenchard Memorial Lecture. In: The Royal Air Force Air Power Review 1 (2005), pp. 1-9; quotation p. 5. 4. Omissi, Air Power (see note 2), p. 24. 5. The implicit and explicit included statements about personal and external perceptions and about the understanding of tasks of the RAF are of particular interest. Articles, memos, personal bequests and operation reports of both campaigns are useful primary sources. However, the sources have a different scope and from many protagonists there are none available at all. As a result, there is a need for generalizations and deductions that have to be made as carefully as possible. Furthermore, the personnel files are still administered by the British Ministry of Defense and will be kept under seal for several years to come. 6. The National Archives (TNA) AIR 5/338, Bombing policy in Iraq, 1923. 7. C.H.K. Edmonds, Air Strategy, In: Journal of the Royal United Service Institution 69 (1924), pp. 191-210; quotation p. 195. 8. TNA AIR 10/1910, Royal Air Force War Manual, Chapter 8, 1928. 9. TNA AIR 5/170, Air Staff Memorandum No. 46, Notes on Air Control of Undeveloped Countries, 1930. 10. TNA AIR 20/4770, Bombing Policy, 1941/42. 12. TNA AIR 10/2311, Royal Air Force War Manual, Chapter 8, 1940. 14. TNA AIR 5/168, The power of the Air Force and the application of this power to hold and police Mesopotamia, 1920. 15. J.A. Chamier, The use of the air force for replacing military garrisons, In: Journal of the Royal United Service Institution 66 (1921), pp. 205-216; Quotation p. 210. 16. TNA AIR 10/1910, Royal Air Force War Manual, Chapter 14, 1928. 17. TNA AIR 10/2311, Royal Air Force War Manual, Chapter 1, 1940. 18. TNA AIR 5/338, Arthur Harris, Bombing policy in Iraq, 1923/24. 21. TNA AIR 2/7852, Arthur Harris, Bomber Command offensive against Germany. Publicity policy, 1943/44. 22. Royal Air Force Museum Hendon B 2592, Salmond Papers. 23. David Sanger, www.tagesschau.de (06.06.12).